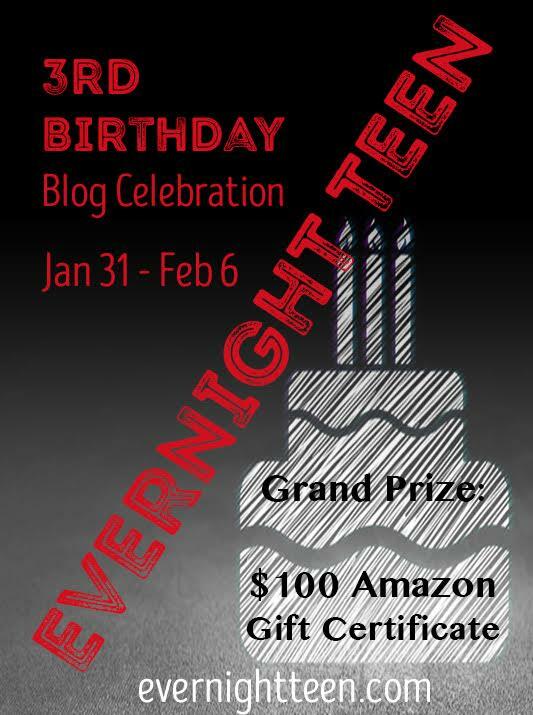 Evernight Teen’s 3rd Birthday Blog Hop! EVERNIGHT TEEN is celebrating their anniversary this month with a 3rd Birthday Blog Hop! It’s EVERNIGHT TEEN’s birthday but we’re giving out the presents with a Grand Prize of a $100 Amazon gift certificate! EVERNIGHT TEEN books feature fresh teen fiction that is raw, gritty and real. Whether paranormal, contemporary, sci-fi or suspense, our books are about real issues and pack a strong emotional punch. You’ll find cutting edge fiction that today’s young adults can relate to and will keep you turning the pages long into the night. “Don’t you have anything better to do than drive me around?” I ask, hugging my bag to my chest and studying his reaction. When he smiles, my stomach still flutters like it did years ago. But I’m not a child anymore. I don’t have romantic visions of the future like I once did. Wesley makes me feel safe, and for the moment, safe is a blessing. I’m not sure I could have survived this long without him. “Someone has to make you go to therapy,” he replies, but even when he says the word therapy, it still sounds like it belongs in everyday conversation. Like it’s normal. I lean back against the headrest and let a smile lengthen my lips. “I don’t mind seeing Klara,” I tell him, even though I hate sitting in Klara’s office, repeating the story of my abduction week after week. I’m not sure why I lie. I guess it’s petty to complain about the woman assigned to help me, when he’s volunteering his time to make sure I have the chance to receive her help in the first place. “But you hate art therapy,” Wesley finishes for me. His voice is tight when he says it, and I’m surprised. My reluctance to attend this second form of therapy has resulted in many drawn out conversations with my parents. Some have ended in shouting matches, others in tears, and most have been dispirited, fruitless attempts to find a solution to please us all. It’s no secret I want to stop my art therapy, nor is it a hidden fact Mom and Dad think art therapy is the most crucial aspect of my rehabilitation. But I didn’t realize Wesley thinks the sessions are important, too. The van makes a clunky right turn off Bayfield Street, and after driving past a neighborhood of old houses and new townhomes, an office park comes into view. I can spot the windows of the Healing Expressions clinic, three floors up in the far building. My throat is already dry, and we haven’t even parked yet. My legs regained their strength during the ride, but my feet are tingling again. I grip my bag tightly. “See you in an hour?” Wesley asks as he pulls up in front of the building. His phone buzzes, rattling the cup holder it sits in. I wonder who’s calling, and wish I could stick around to find out. I would love to sit in this van, answering phone calls or spinning the radio dial, talking to Wesley or not talking and simply enjoying a drive down an endless sunny road. Instead, I only nod at Wesley’s question, pushing open the door and climbing out of the seat before I lose my nerve and beg him to take me away from the clinic. Wesley gives me a wave before reaching down to grab his phone. I stare at him for a few long seconds, and then turn with a sigh and walk, still a little dazed, towards the building. The glass windows catch the sun, and I have to shield my eyes from the blinding gleam. Around me, the world is bright and warm and alive. It’s beautiful outside––late spring in full bloom. I used to love this time of year, but today the vibrant landscape is shaded black and grey. To me, the world has lost all color. Once, I would have delighted in painting it. Now, the idea terrifies me. 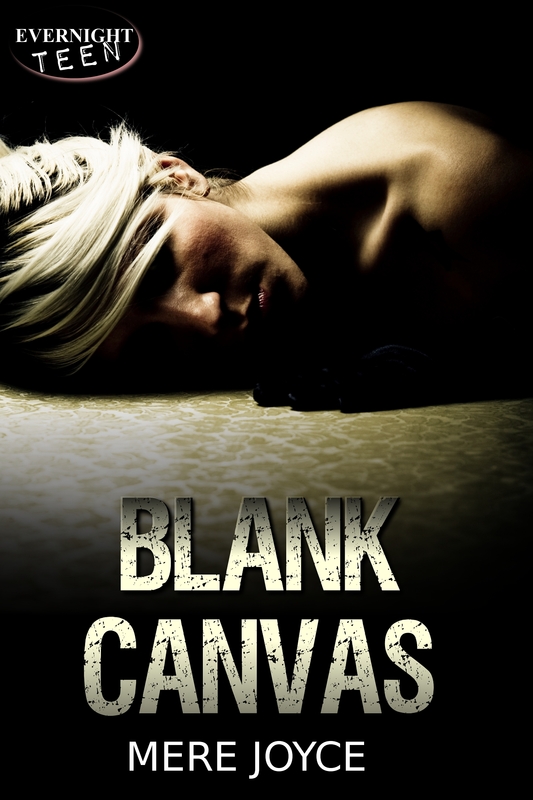 To add to the festivities, I’m giving away one 1 (one) signed print copy of Blank Canvas! To be entered into the giveaway, comment below telling me what’s your favourite work of art? A winner will be chosen after February 6, 2016. Plus, enter the Rafflecopter Giveaway below, and be sure visit each stop on the BLOG HOP for more chances to WIN the GRAND PRIZE of a $100 Amazon Gift Card. You’ll receive bonus entries for commenting on each blog! And to check out more awesome books for teens, visit Evernight Teen! Hi there! Hope you’re having a great winter up there in the north. The Starry Night. My daughter has one not the real one lol hanging in her house and I just love looking at it..